Recent U.S. policy reports express a growing concern for the supply of scientists, science workers and science teachers; c.f., National Research Council 2006 report Raising Above the Gathering Storm and the National Center on Education and the Economy 2007 report Tough Choices Tough Times. The STEM (Science Technology Engineering Mathematics) teacher and workforce shortages have two components (1) declines in attracting and retaining individuals into science/science education programs of study and (2) into places of employment. These recent reports show that uptake of STEM courses and careers are waning. Then there is the documented evidence that the development of youth attitudes toward science, both negative and positive, begins in and around middle school grades (ADEEWR, 2008). Thus, much of the focus for addressing the problems is on schools and schooling K–16. Consensus review reports (Carnegie Corporation of New York, 2009) are placing much of the blame on the curriculum models citing a lack of relevance and an avoidance of the core scientific practices that frame science as a way of knowing; e.g., critiquing and communicating evidence and explanations. The NRC K–8 science education synthesis research study Taking Science to School (Duschl, Schweingruber & Shouse, 2007) is another consensus report that makes recommendations about the reform of science curriculum, instruction and assessment. The TSTS report concludes that K–8 science education should be grounded in (1) learning and using core knowledge, (2) building and refining models and (3) participating in discourse practices that promote argumentation and explanation. The report also concludes that a very different model of teacher education must be put into place. That raises an important set of issues. Where in the undergraduate curriculum do future K–8 teachers engage in and learn to use the core knowledge, building and refining models and argumentation and explanation practices? The typical introductory survey science courses taken by non-science majors and elementary education candidates focus more on the ‘what we know’ of science and less on the ‘how we know’ and the ‘why we believe’ dynamics and practices of science. Determining the level and degree of scientific practices in science courses is essential for shaping and understanding preservice/inservice teachers’ engagement and confidence in doing science when planning and leading science lessons in their own classroom. Science courses that focus exclusively on teaching what we know in science are inappropriate for future teachers. Teacher candidates need courses in which they participate in science practices. One promising approach we have been considering is infusing SENCER courses into the science course sequence for future teachers (e.g., subject matter, SENCER, science teaching methods). Science Education for New Civic Engagements and Responsibilities (SENCER) course frameworks offer a potential solution to both engagement in and understanding of science practices. The SENCER commitment is to situate science learning in civic or social problems to increase relevance, engagement and achievement in science content knowledge and inquiry practices. This article reports on an analysis of a subset of SENCER courses that take up environmental problems as the civic engagement issue. Know, use and interpret scientific explanations of the natural world. Participate productively in scientific practices and discourse (Duschl et al 2007). With respect to changing how and what science is taught, one important cohort of science students is preservice elementary (K–8) teachers who have low self-efficacy when it comes to science (Watters & Ginns, 2000). The K–8 education cohort’s lack of confidence and experience within the science experiences they had contributes to maintaining a cycle in which the students they teach lose interest and confidence in learning science due to poor teaching strategies, misdirected curriculum and weak teacher knowledge. (Wenner, 1993). Sadler (2009) has found that socio-scientific issues (SSI) affect learners’ interest and motivation, content knowledge, nature of science, higher order thinking and community of practice. Thus, it is not a surprise that SENCER courses have successfully demonstrated increases in student enthusiasm (Weston, Seymour & Thiry, 2006). However, more information is needed to determine how SENCER courses impact student achievement in core knowledge of science and with science practices that involve model-building and revision. The first step toward conducting research on the impact of SENCER courses on learning is to ascertain which SENCER courses are implementing scientific practices; e.g., raising research questioning, planning measurements and observations, collecting data, deciding evidence, locating patterns and building models, and proposing explanations. The driving question is can SENCER courses when placed between science courses and science teaching methods courses effect teacher thinking and practices. Co-designed courses represent another model that brings science and science methods courses together. The co-designed courses are planned and taught by both science and science education faculty. Zembal-Saul (2009, 687) has found that co-designed courses that adopt a framework for teaching science as argument to preservice elementary teachers served “as a powerful scaffold for preservice teachers’ developing thinking and practice . . . [as well as] attention to classroom discourse and the role of the teacher in monitoring and assessing childrens’ thinking.” Schwartz (2009) found similar positive effects on preservice teachers’ principled reasoning and practices after using an instructional framework focusing on modeling-centered inquiry coupled with using reform-based criteria from Project 2061 to analyze and modify curriculum materials. What these two studies demonstrate and the SENCER model supports is the effectiveness coherently aligned courses can have on students’ engagement and learning. Such shifts in undergraduate courses and teaching frameworks will contribute to breaking the cycle that perpetuates low interest and high anxiety in the sciences at all levels of education, K–16. Research shows that preservice elementary school teachers tend to enter the profession with inadequate knowledge of scientific content and practice. Preservice elementary teachers answer only 50 percent of questions correctly on a General Science Test Level II (Wenner, 1993). Stevens and Wenner’s (1996) surveys of upper level undergraduate elementary education majors are consistent with other research that 43 percent of practicing teachers had completed no more than one year of science course work in college (Manning, Esler, & Baird, 1982; Eisneberg, 1977). The lack of courses and experiences in science reflected the low self-efficacy in science among preservice elementary school teachers (Stevens & Wenner, 1996; Wenner, 1993). If no changes are made to current coursework required of preservice elementary school teachers, they will continue to have low self-efficacy in science and therefore avoid teaching this subject (Stevens & Wenner, 1996). Thus, teachers are unlikely to use inquiry within their science lessons with the result that students are not exposed to scientific practices. The cycle of negative experiences with science does not have to be accepted as an educational norm; as the studies by Zembal-Saul and by Schwartz demonstrate. Changes can be made that coherently align science courses with methods courses. SENCER courses can serve as a bridge to connect real-world issues and scientific knowledge with the positive impact of raising motivation and engagement among non-majors’ and preservice elementary teaches’ to learn science (SENCER, 2009). Evidence shows that learning science within the context of a current social problem helps to motivate preservice teachers and enables them to form goals that include learning scientific concepts and practices (Watters and Ginns, 2000; Sadler, 2009). Preservice elementary teachers who experience scientific practices and do investigations that build and refine scientific evidence and explanations can more informed decision makers about science and the teaching of science. Using evidence to ascertain patterns of evidence and models. Employing the models and patterns to propose explanations. In a full-inquiry or a guided-inquiry, students formulate scientific questions, plan methods, collect data, decide which data to use as evidence, and create patterns and explanations from the selected evidence (Duschl, 2003). Science engagement becomes more of a cognitive and social dialectical process as groups and group members discuss why they differed in data selected to be evidence and varied in the evidence used for explanations (Olson & Loucks-Horsley, 2000). Students’ participating in these interactions tend to build new knowledge and/or to correct previous misconceptions about a scientific concept (Olson & Loucks-Horsley, 2000). 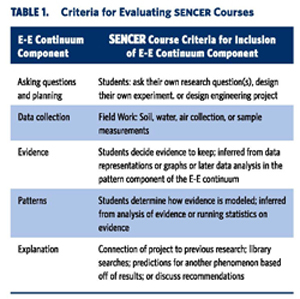 The research question asks to what extent do SENCER courses model and use scientific practices that are linked to obtaining and using evidence to develop explanations? SENCER courses were selected from the SENCER website and examined to determine the opportunities provided to engage in scientific practices. Only SENCER courses designed around environmental topics (e.g., water, earth, soil, rocks) were selected because these courses offer up integrated science opportunities. Next, course syllabi, projects and activities were reviewed to ascertain students use, or the potential for use, of data-driven E-E scientific practices. SENCER courses were considered to emphasize planning and asking questions if students asked their own research question, designed their own experiment, or designed an engineering project. A course that stressed data collection showed that students went into the field and collected soil, water, or air, or they took measurements of samples. A SENCER course provided students practice in evidence if they decided which data to keep as inferred by students representing data or creating graphs. Practice in evidence was also inferred if students analyzed data later. Students could not complete this activity without deciding which evidence to use. A course gave students experience in patterns if students determined how the evidence was modeled as seen by analysis of evidence or running statistics on evidence. Lastly, a course allowed students to practice using explanation if students connected their project to previous research or theories as seen in library searches, if they made predictions for another phenomenon based off of their results, or if they discussed recommendations. Courses that included scientific content but focused on practices used in the humanities such as research and communication with another culture and were left out of this study. A summary of the criteria for evaluating the courses appears in Table 1,below. The names of the courses located on the SENCER website appear in Tables 2 and 3. Scientific practices identified were recorded as an X in Table 3 with further details on how the course fulfilled the criteria. Courses that did not meet the criteria received an N/R (no result). Each X was worth one point on the scale. Each scientific practice identified was worth one point on the scale. 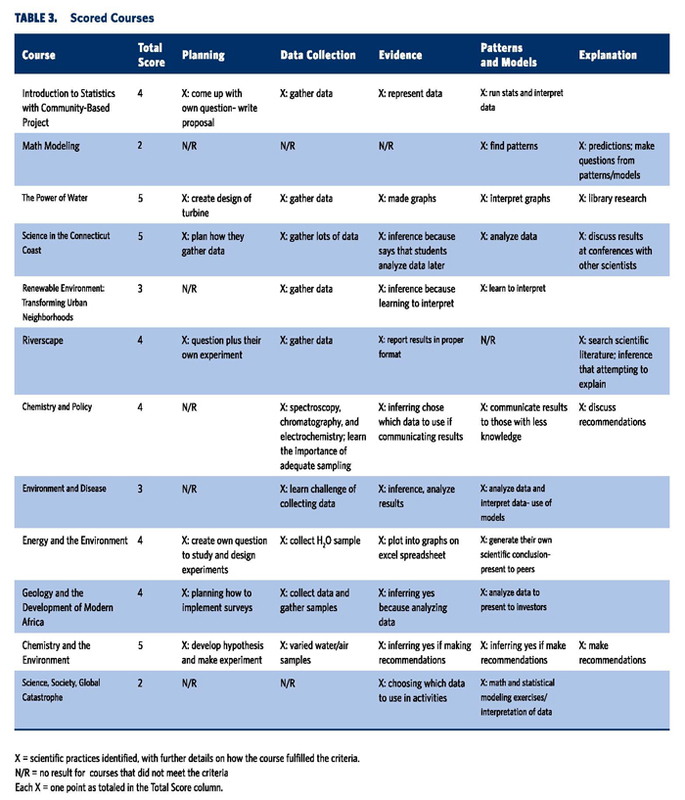 A scale from 1–5 was created to effectively compare scientific practices identified in each of the course modules. A score of 1 indicated that the course module only incorporated one portion of scientific practice, and a score of 5 indicated that the course emphasized all five portions of scientific practice within the E-E continuum. Therefore, a course with a score of 1 did not emphasize scientific practice whereas a course receiving a score of 5 heavily emphasizes scientific practice. Course demographics were also investigated from the SENCER website. Information researched included type of institution, class size, student year, major and class time (Table 2). Demographic information was then used to interpret any differences seen in level of scientific practice among SENCER course modules. The results and findings are reported in 3 sections: Differences in Courses, Common Themes Among Courses, and Demographic Patterns. Differences in courses are presented from the highest emphasis on scientific practices (5) to lowest emphasis of scientific practices (1). Two courses, “The Power of Water” and “Chemistry and the Environment,” received a 5 because they provided students with practice in each aspect of scientific inquiry (Table 3). However, they approached various aspects of inquiry differently due to the nature of the problem being solved. “The Power of Water” took an engineering method in which students designed the most efficient micro-hydro-power turbine for a hypothetical small rural village whereas “Chemistry and the Environment” students formulated their own question to research about some environmental chemistry issue on their campus. Most of the courses scored a 4 (Table 3), these included “Introduction to Statistics with Community-based Project,” “Chemistry and Policy”, “Renewable Environment: Transforming Urban Neighborhoods,” “Riverscape,” “Environment and Disease,” “Energy and the Environment,” and “Geology and the Development of Modern Africa.” These six courses differed from “The Power of Water” and “Chemistry and the Environment” because they did not allow students to explain their patterns or models. Two courses that received a 4 did expose students to explanation, but left out some other aspect of scientific practices in inquiry. Students in “Chemistry and Policy” did not create their own scientific question to study, and “Riverscape” did not provide students with practice in creating create patterns. The “Riverscape” course is a major source of interest because it was designed specifically for preservice elementary school teachers in the attempt to gain appeal in science and learn scientific practices. Two courses provided students with the opportunity to use 3 out of 5 practices within scientific inquiry, giving them a score of 3. “Renewable Environment: Transforming Urban Neighborhoods” and “Science in the Connecticut Coast,” allowed students to collect data, provide evidence, and create patterns or models. However, students did not practice the planning and explanation stages of scientific inquiry. Two courses that gave students experience in the fewest scientific practices scored a 2. There were no courses that scored a 1. “Science, Society, and Global Catastrophe” and “Math Modeling” differed in the inclusion of scientific practices. “Science, Society, Global Catastrophe” gave students training in finding evidence and creating patterns and models but not in the remainder of scientific practices. “Math Modeling” enabled students to practice finding evidence and creating explanations, but the course provided students with the remaining portions of scientific inquiry. SENCER courses with differing levels of scientific practices tended to have common themes for practicing scientific inquiry. One major theme was the use of collaboration as seen through group work on a scientific project. Most course modules shown on the SENCER website specifically state that students work in groups for their projects. Others such as “Riverscape” and “Chemistry and Policy” do not directly state that students do group work, although collaboration is emphasized within the course. The only course that did not emphasize collaboration was “Renewable Environment: Transforming Urban Neighborhoods,” although this information may have been left off of the SENCER website. While not specifically stated within the E-E continuum, collaboration plays an important role within inquiry. Students who are able to discuss scientific concepts with one another can articulate ideas and argue enabling them to reconstruct their own ideas of scientific meaning (Olson & Loucks-Horsley, 2000). Another common theme among high practice SENCER courses was that students communicated their results with one another in various formats. Most courses incorporated formal presentations at the end of the project for the rest of the class. Others used formal presentations, although they were created for different audiences such as the general public or for a buyer of potential land for diamond extraction. Other course modules such as “Science in the Connecticut Coast” and “Environment and Disease” based communication more on discussion of scientific concepts. Despite differences in the means of presenting ideas in class, communication of results is an important skill essential to inquiry-based learning. The SENCER courses differed in demographic information. The total number of students participating in class was widespread between 5 and 130 students (Table 2). Laboratories decreased class size to roughly 20 students. However, more information is needed for “The Power of Water” laboratory class size. Student year ranged from freshmen to graduate students within the course. Student type varied greatly from non-majors and preservice elementary school teachers to math or chemistry majors. Total class time differed among the courses in addition to the way the time spent was scheduled (Table 2). Additionally, student major had little impact on scientific practices emphasized within SENCER courses. Majors used a varying number of scientific practices among the courses studied. Math students in “Introduction to Statistics with Community-Based Project” used more areas of scientific practice than math majors in “Math Modeling” as seen in Table 3. Majors also did not use any more scientific practices than non-majors in these courses. “The Power of Water” allowed students to use all 5 elements of scientific practice in inquiry whereas majors in “Math Modeling” were only given the opportunity to practice 2 aspects. Class year also did not affect the ability to expose students to use scientific practices. As expected, SENCER courses enabled upperclassmen and graduate students to gain practice in conducting science as seen in “Riverscape.” However, many SENCER classes also provided underclassmen with a rich experience in practicing science. For example, “The Power of Water,” consisting of sophomores, provided students with practice in every area of scientific inquiry. Lastly, class time did not affect student exposure to using scientific practices. Courses that received the same scores consisted of a wide variety of time scheduled. “Chemistry and Policy” devoted much more time toward class time than “Environment and Disease,” but students experienced the same number of scientific practices. 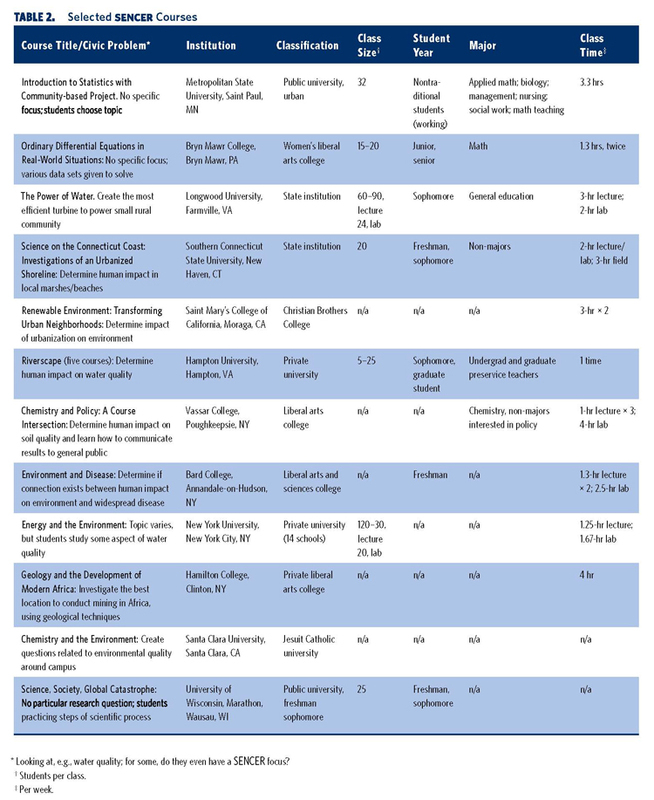 Distinctions in SENCER course characteristics have led to varying opportunities for students to gain experience in doing scientific practice as seen in this study’s scores. Those with the highest scores allow students to have the greatest amount of ownership over their own work. Courses with a score of 5 provide students with the ultimate source of ownership in allowing them to choose their own question to study. Modules with scores of 3 and 4 may not allow students to ask their own questions to study, but they do provide students with responsibility over the remainder of scientific practices in the E-E continuum. Courses with the lowest scores provide students with the least amount of ownership over their own work. Students are given a piece of someone else’s project and continue a small portion of that project. For example, students are given another project’s data set that they are expected to analyze. Future SENCER courses should consider giving students as much ownership over their work as possible to encourage student experience in using scientific practices. The nature of data collection also had an impact on the level of scientific practices used within course modules. Courses in which there was easy access to collect soil or water samples of interest along with equipment to measure samples showed a higher level of scientific practices within the E-E continuum. Courses such as “Math Modeling” and “Science, Society, and Global Catastrophe” may not have allowed for easy access to gather water or soil samples. Therefore, the course was unable to provide students with the opportunity to gain practice in data collection. “Geology and the Development of Africa” found a loophole that enabled students to gather their own data by using a computer simulation. Students did not actually collect rock samples in this class, but were able to collect data from their computer simulation. Perhaps computer simulations could be used in other courses that do not have easy access to take samples from the environment. While these characteristics provide critical information to increase a SENCER course’s use of scientific practices, traits that have no effect on level of scientific practices also offer great insight to increase student experience in performing science. It is reassuring that SENCER courses can be flexible enough in incorporating inquiry for small as well as large class sizes. Future courses using the SENCER approach may be designed knowing that students can successfully learn scientific practices within a large classroom size. SENCER courses may cater to majors and especially to non-majors who have little experience in scientific practices. It is appropriate to use SENCER not only for upper level courses, but it is also critical to apply these modules to lower level classes. SENCER courses provide a way to incorporate scientific practices within student learning. The integration of social issues with science builds preservice teacher interest in scientific practices. As these students gain experience in using scientific tools, they become more confident in incorporating science into their future elementary classroom. Perhaps our future teachers’ greater enthusiasm for science will spark student interest in the sciences. ADEEWR, Australian Department of Education, Employment and Workplace Relations. 2008. Opening up Pathways: Engagement in STEM Across the Primary-Secondary School Transition. Cantabera, Australia. Burns, W.D. 2002. “Knowledge to Make Our Democracy.” Liberal Education 88 (4): 20–27. Carnegie Corporation of New York. 2009. The Opportunity Equation: Transforming Mathematics and Science Education for Citizenship and the Global Economy. www.opportunityequation.org (accessed December 14, 2009). Duschl, R. 2003. “Assessment of Inquiry.” In Everyday Assessment in the Classroom, J.M. Atkin and J. Coffey, eds., 41–59. Arlington, va: NSTA Press. Duschl, R., H. Schweingruber, and A. Shouse, eds. 2007. Taking Science to School: Learning and Teaching Science in Grades K–8. Washington, DC: National Academy Press. Eisenberg, T.A. 1977. “Begle Revisited: Teacher Knowledge and Student Achievement in Algebra.” Journal for Research in Mathematics Education, 8, 216–222. Kenyon, L. and B. Reiser. 2004. “Students’ Epistemologies of Science and Their Influence on Inquiry Practices.” Paper presented at the annual meeting of National Association of Research in Science Teaching, April 2004, Dallas, TX. Kuhn, L. and B. Reiser. 2004. “Students Constructing and Defending Evidence-based Scientific Explanations.” Paper presented at the annual meeting of National Association of Research in Science Teaching, April 2004, Dallas, TX. Lehrer, R. and L, Schauble. 2006. “Cultivating Model-based Reasoning in Science Education. In The Cambridge Handbook of the Learning Sciences, K. Sawyer ed., 371–388. New York: Cambridge University Press. Manning, P.C., W.K. Esler, and J.R. Baird. 1982. “How Much Elementary Science is Really Being Taught?” Science and Children, 19 (8)” 40–41. Petrosino, A., R. Lehrer, and L. Schauble. 2003. “Structuring Error and Experimental Variation as Distribution in the Fourth Grade. Mathematical Thinking and Learning 5 (2/3): 131–156. Sadler, T. 2009. “Situated Learning in Science Education: Socio-Scientific Issues as Contexts for Practice.” Studies in Science Education 45 (1): 1–42. SENCER, Science Education for New Civic Engagements and Responsibilities. http://www.sencer.net (accessed December 14, 2009). Schwartz, C. 2009. “Developing ‑vice Elementary Teachers’ Knowledge and Practices Through Modeling-Centered Scientific Inquiry.” Science Education 93 (4): 720–744. Seago, J.L. Jr. 1992. “The Role of Research in Undergraduate Instruction.” The American Biology Teacher 54 (7): 401–405. Stevens, C. and G. Wenner. 1996. “Elementary Preservice Teachers’ Knowledge and Beliefs Regarding Science and Mathematics.” School Science and Mathematics 96 (1): 2–9. Wenner, G. 1993. “Relationship Between Science Knowledge Levels and Beliefs Toward Science Instruction Held by Preservice Elementary Teachers. Journal of Science Education and Technology 2 (3): 461–468. Watters, J.J. and I.S. Ginns. 2000. “Developing Motivation to Teach Elementary Science: Effect of Collaborative and Authentic Learning Practices in Preservice Education.” Journal of Science Teacher Education 11 (4), 301–321. Zembal-Saul, C. 2009. “Learning to Teach Elementary School Science as Argument.” Science Education, 93 (4): 687–719. Amy Utz graduated from Bucknell University in 2005 with a B.A. in Biology. In 2007, she graduated from Drexel University with an M.S. in Biology. She currently is a graduate student within the Master’s of Education program at Penn State University. She is completing her student teaching and plans to become a high school biology teacher. Ric hard A. Duschl, (Ph.D. 1983 University of Maryland, College Park) is the Waterbury Chaired Professor of Secondary Education, College of Education, Penn State University. Prior to joining Penn State, Richard held the Chair of Science Education at King’s College London and served on the faculties of Rutgers, Vanderbilt and the University of Pittsburgh. He recently served as Chair of the National Research Council research synthesis report Taking Science to School: Learning and Teaching Science in Grades K–8 (National Academies Press, 2007).